I'm pleased to announce a new ebook in our Country Living Series entitled Prepper Gardening. 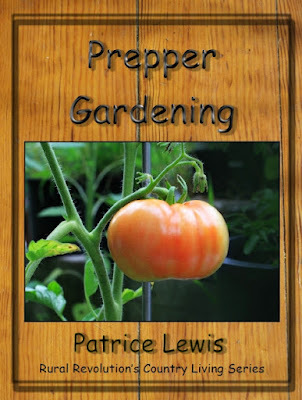 This is a fairly broad piece that covers a number of factors distinguishing between a survival garden and a regular garden. At $2.99 and nearly 8,000 words in length, we feel it's a bargain. Also, some readers expressed concern about using the checkout features on the Country Living Series website because it requires an address. This is unnecessary information, since the ebooks are sent electronically (not mailed). We've requested this feature be disabled, but were told it was impossible. So -- and we've tested this -- you can input a false address as long as the town and zip code match. We put up a notice concerning this on the Country Living Series website, but it's kinda small print. At the end of your book you had a photo of a fist with the saying gardening is a defiant act plus you get strawberries or something like that. You had that in another blog post years ago and I had it made into a T shirt for my wife. One of my better gifts to hear her tell it! I would like to get a copy of the book. But I want a paper copy. Are paper copies available? No, I'm afraid not (the electronic format is one of the reasons we can keep the prices low on these ebooks). The best I can recommend is to print it yourself.